It’s finally here. Church of God Convention 2015: Be Bold. Reclaim. officially kicks off this evening at Crossings Community Church in Oklahoma City. 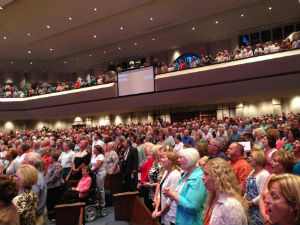 From Washington State to Florida, Church of God pastors and laypeople have gathered to worship the Lord and rally together for the cause of Christ. Award-winning contemporary Christian artists Selah will lead the saints in times of inspirational worship until longtime Church of God speaker Timothy Clarke takes the stage to deliver the Word with power and clarity. But before the kickoff session, which will be broadcast live over the Internet at www.jesusisthesubject.org/convention-live-streaming at 7:00 PM CDT, a variety of pre-convention workshops and events are expected to draw the early-arrivals. For six weeks leading up to Be Bold. Reclaim., Church of God congregations and individuals faithfully prayed for the convention with the aid of a special prayer guide developed by Leroy Quashie. The Church of God believes prayer is absolutely vital to a God-honoring event, and as such, prayer will take place prior to the start of each day (check the daily schedule at www.JesusIsTheSubject.org/schedule for details and location). The primary prayer gathering will take place today at 10:00 AM in the Chapel at Crossings. John Boedeker will lead. From 1:30 until 3:00 PM, Jim Lyon, general director of Church of God Ministries, will take questions at a town hall-style meeting. In his familiar transparent style evidenced in the title of his popular 2011 book Go Ahead, Ask Anything, Jim anticipates yet another opportunity to share from the heart. The event will take place in the Venue at Crossings. From 3:30 until 5:00 PM, conference options range from the new Be Bold Academy and the new Global Strategy (more on this soon! ), to workshops for youth leaders and community impact. While many Anderson University alumni enjoyed an Oklahoma City Dodgers baseball game last night, many others will also attend Mid-America Christian University’s barbecue picnic beginning at 4:30 on the MACU campus (www.macu.edu). Once again, we are delighted to offer live streaming for much of the convention (www.jesusisthesubject.org/convention-live-streaming). Many are planning to gather at churches and homes across the country and around the world to tune in to the evening worship sessions and the General Assembly. We’d love to hear from those who are joining in via the Internet. Let us know on Facebook (www.facebook.com/pages/Church-of-God-Anderson-Indiana/166439662312) or Twitter (www.twitter.com/ChoGMinistries) that you’re with us! Throughout the convention, the social media savvy (and the not-so-savvy!) will use #BeBold2015 to share convention-related pictures and posts. Join the conversation! Details on Church of God Convention 2015 are available at www.chogconvention.org. Learn more about the Church of God at www.jesusisthesubject.org. This entry was posted in All Church of God, Church of God Convention and tagged Anderson, camp meeting, Campmeeting, CHOG Convention 2015, Church of God Convention, Crossings Community Church, General Assembly, Indiana, Jim Lyon, NAC, North American Convention, Oklahoma City, reformation mnovement. Bookmark the permalink.